This is a very simple hat and very quick to make. Using a J hook and worsted weight yarn, I used red heart, and it fits a 20 1/2 inch head very nicely. Very easily adjustible by either adding increase rows or taking away. Rnd 13) ch1, sc in same st and in next 21 sts, ch5, sc over all ch 10's by bunching together and into 5th dc of the 9 skipped dc on row 9, ch5, sc in next dc and in each dc around slip stitch to join, fasten off. I hope you can see in the pic how I did row 13. Please feel free to sell your creations as you like... just maybe link to my pattern or tag with my website. Thanks, and happy hooking. Beautiful hat! I was looking for the perfect hat to make for a friend's little girl, this is it! I love this hat, and your little girl is adorable!! 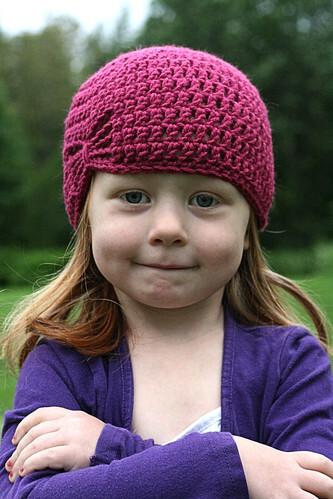 I've been looking for a cute hat to make for my girls and my god-daughter, this one is it! What a great hat! Thanks for sharing the pattern. This is so adorable! I can't wait to make this! Thanks everyone and you are all welcome! Have fun! I love it! Can I ask what yarn you used? OOPS.. I can't believe I forgot to put that down. I used Red Heart Super Saver. What an adorable hat. I think I have enough leftover yarn to try that for my little one. Thank you for sharing. Please forgive a question from a beginner. I am stuck on round 3 because I don't understand the *, I only see one * and am not sure what to repeat. Is it 1 DC in (all) each of the previous st (so you're just adding 1 extra stitch for that row), or *2DC in first stitch, 1DC in second stitch* repeat that for the round? Cute hat, making it for my toddler, thank you! Wow, this is GORGEOUS! I would love to link to this if you don't mind! It's going on my "must hook" list right now! I went back and tried to adjust round 3, hope that helps. 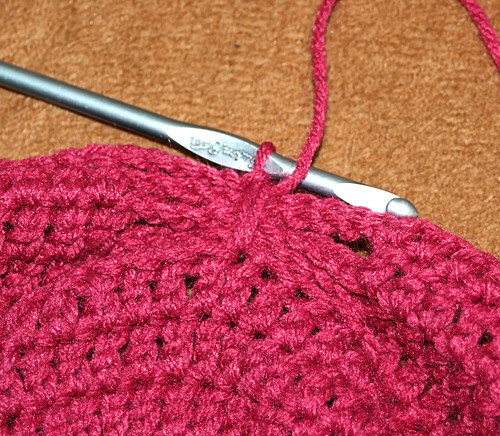 You are adding an extra stitch after every one st on that round, 2sts on the next round and so on. Yes, please go ahead and link! Oh my gosh! I loved the Jayde hat, but this tops that a million times! I absolutely love it. It's the prettiest little hat I've seen in a long time. Thank you for offering this as a free pattern. You are very welcome! I'm glad you liked it. oh I love it I may very well learn to crochet just for this hat! LOVE the hat. Great way to spice up the plain ol beanie! I love it. Can't wait to give it a try. Thank you for sharing your hard work. What fabulous patterns you have on your site. And your photos are gorgeous. Thanks so much for sharing. I can see I will be lurking for months to come! Very cute ited. Thanks for sharing the pattern. I don't know what's cuter, the hat or Olivia! Oh my goodness ... adorable!!! Hat and Olivia! Thank you so much! Love the hat - thanks for sharing! Such a darling pattern! I am so going to make this cute hat! The best pattern i ever saw! It is beautiful and my favorite of all time! wonderful pattern for a beanie, I love it! I'm going to give it a try. My first crochet attempt. Love little hat! My daughter adores butterflies and she will love this hat! Thanks for helping me figure out what to make her for Christmas!! Im a huge fan of butterflies. So when I saw this pattern I had to make it...sitting here making it right now. My daughter loves the hat so far. This hat is wonderful, I just made it for my daughter. Thank you! Such adorable pics and such a beautiful hat! I can't wait to try this pattern. I was going to send you a picture, but was unable to find an email. If you would like to see how it turned out, then email me and I'll send it to you. I also had a "novice" question. If I was going to increase the size a bit, how would I do that and where? I'm guessing that I would add a row for each size increase I wanted, but I just want to make sure. Do I add a row of increase in stitches?? Or just repeat a row?? Will that mess up the rest of the hat if I continue on with the directions after adding rows (I'm more worried about the stitch count for the butterfly part)? Thank you so much for the Pattern! I made one last night, but made a few adjustments for an adult size. I noticed with starting the first round as 11 DC, it made a cone like shape to it after a while (fine when it is being worn) but I decided to start off with 14 DC, as I would with the many infant hats I've made and it made it much easier. If you add another row of increases, ch2, * 2dc, dc in next 4dc , repeat from * around, join. It actually makes the hat too big for an adult size, Go up to a K hook and I would recommend just adding another Round ch2, dc in same st and each st around and it should make it big enough for an adult size, I'm 21 and it fits me, after the change from 11 DC to 14 DC. I hope this helps with anyone wanting to make adult sizes! I've been getting many requests for them! (sorry had to edit I got my hat patterns mixed up! in round 4 it says "2dc, dc in next 2dc, repeat"
Thank you SO much for a wonderful hat. I just made one for my daughter Haylee and it literally took me about 45 minutes. Fast and easy, perfect for me! Here is a link to a picture of my hat if you'd like to take a look. I am going to attempt the granny square bag next I think. Thank you for sharing your pattern of Olivia's Butterfly! I found your site by accident one day searching for crochet hat patterns. The hat looks so good on your daughter (who is adorable) that I had to make one for my little girl. The pattern was very easy to follow and was made in less then an hour. My little girl is only 2, with a smaller head so I removed row 8 and it was a perfect fit. A few photos can be seen on my blog at sweepinghands.wordpress.com if you are interested. Thanks again! Awesome, simple, adorable pattern! Thank you! The pattern was very easy to follow! this was so fun, easy and quick to make! what an awesome idea to change just a few stitches to make it unique and beautiful. i made one for my two year old cousin and I'm planning to make a matching scarf too! i'll send a pic/pattern if you'd like! I have just started crocheting again and tried this pattern, I love it, great directions and so darling. Thank you so much!! Thank you so much for this pattern!! It is so beautiful and easy to do. As a novice crocheter I have a question - If I wanted to make this for a one yr. old could I go down a hook size and take out row 8? LeAnne, I had the same problem. Pulled out what I had done and tried with an H hook and it was still too big. I also tried making the stitches so tight that I almost couldn't work with it. Any suggestions? I'm in the middle of making this now, it's quick and easy! I'm using a size I hook (and a worsted weight yarn, which is slightly thinner than Red Heart Classic), and it looks like it would be about the right size for a 4-5 year old. I LOVE that you are okay with people selling a creation made by your pattern. Doesn't happen often any more in a "me me me" society. You're awesome. I'm so glad you all like the pattern. I'm sorry if I missed any one that needed help. I have been really busy. Happy New Year everyone! I took out row 8 and this hat is even too big for my large noggin. I need it to fit a 3 year old. Only thing I can think of, is that the weight of the yarn is too bulky?? (Even tried I hook)! Just whipped this up for my 2.5 year old. Used an old ball of worsted weight acrylic in a mauve color. The only change I made was to do 5 single crochets around the chain to make the body of the butterfly. Can't wait to see her face when she finds it at her place at the table in the morning! I haven't posted this on my blog yet, but I will as soon as I get a good photo. Made this hat for myself, will be posting it tomorrow on my blog with a direct link to your page. Thanks a lot for the pattern. Hey, just finished the hat! finished it in a few hours, cute little diddy, i love how the butterfly came out. I used an 'i' hook and a slightly lighter yarn, still worked, and fits my head. This was my second attempt at the hat, I think i tried it the first time i didn't understand crocheting in the round very well, not having the number of stitches at the end of each line got me all befuddled, cuz i wasn't sure where to put the sl stich ect. so a few projects later i gave it a try again and have a nice hat for my lil cousin. Thanks! Beautiful Hat! I made this for my daughter in an hour she loves it, thanks for sharing!!!! Brilliant!...such a beautiful pattern and a darling little model. I'm off to make one of my own. Thanks so much for the beautiful pattern! It's going to be one of my FO very soon. THANK YOU SO MUCH! I'm a beginner crocheter, I taught myself on you tube and I've been having trouble reading and understand certain patterns I've come across. This is the first one I've done without any hesitation and it turned out PERFECT!! I ABSOLUTELY LOVE IT! my daughter's been wanting a hat with a bow on it this year and i think this might work. i love it! I'm new to crocheting and LOVE all your patterns! Thanks so much for sharing and making them easy to follow. I hope you stop by. It would be a pleasure, if you would visit my blog. Valerie, I saw this pattern on Ravelry and I also saw a picture of a matching scarf. Do you have the pattern for it or did someone just make it up off of the hat?? Thanks!!! Lovely pattern and thanks so much for sharing! I made two last night in about 2.5 hours. Thanks for the beautiful pattern for the hat it is perfect for a beautiful little girl. I plan to give it to a little girl I babysit! It is going to be a wonderful surprise for her. Very easy too, made it in one night! Thanks again. This is such a cute pattern and SUPER easy! These hats are going to make great Christmas gifts. Thank you for posting your patterns. You are very talented. Really lovely pattern and took me just over an hour to make. I used a double knit wool and took the hook size to a UK 3.5mm and it fits my 6 month old. Thanks again for sharing, and God bless you and your beautiful family! I am so glad you are all enjoying the patterns. I'm so sorry if I have missed a comment. I don't always have time to get to every post and check them all. I have posted a few of my emails and check them regularly. Those I will get to as soon as I can. LOVE this hat and LOVE your blog! So many great ideas! I have twin daughters and I have made 2 of these hats in about 4 hours. SOOOOOOOOOOOO CUTE! Thanks so much! Great work. I really like the story. I love your blog, keep it up the good work. I can't wait to see what it is next. 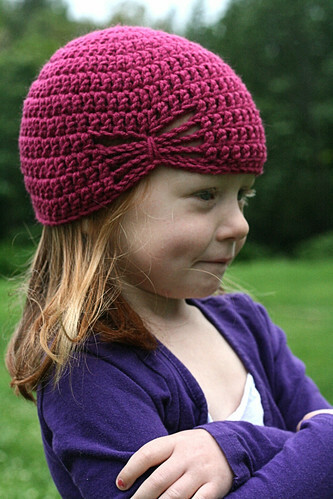 I want to attempt this hat, though I've only followed a hat pattern (or any pattern) once before and it came out huge. Do you think this pattern will fit for a 9 year old or would it need to be adjusted? I just taught my bf's daughter to crochet and I want to give this to her as a birthday gift! Thanks for the pattern, it is so cute! Just finished making one this evening while watching TV for my cousin's little girl...it turned out great! absolutely love all your hats on your blog! This one is my favorite as well as my daughters! Thank you for sharing hope to see more from you soon! Lovely hat, thanks for sharing. This is a beautiful hat ... thank u for sharing! I saw the pattern on C Beth...linked to your pattern and made the hat in 1/2 hour. Lavender boucle with an added ruffle. It is so cute for my baby granddaughter, Azalea!!! What a cute hat! I have been looking for a simple pattern for a chemo cap for my sons friend in Kindergarten. I think I will make her a few, they are so quick to make. Thanks! You were featured on my blog: WouldYouLikeYarnWithThat.blogspot.com! I really like this pattern! Be sure to stop by and grab your button! Thank you for the very quick and easy pattern. Now my nieces will each have their own hat made with love. Hey,I love this hat..looking so pretty in picture.cute girl..keep posting!! I love this hat, and your little girl is adorable!! I've find love been looking for a cute hat to make for my girls and my god-daughter, this one is it! Love, Love, LOVE this pattern. I've already made 4 since I found the pattern about a week ago. I about to start my 5th one. I modified it slightly by using HDC instead of DC. I also like the look of a border or band so I used SC for the 5 rows that create the butterfly. I've use Vanna's Choice for my first one and Sugar & Cream for the last 3. Thank you so much for sharing the pattern. I am from Australia and am trying to make this pattern. The first attempt was way to small and I am new at this. We go by ply wool here and I am confused as to what hook and what ply to use. I also am wanting to make this pattern for an 8month,2,3 and 4 year old and have no idea how to alter the pattern. Any help will be greatly appreciated. I am a beginner and really enjoy crocheting and want to get it right. I'm impressed. You're truly well informed and very intelligent. You wrote something that people could understand buy generic provigil and made the subject intriguing for everyone. I'm saving this for future use. Hello, I am very happy to read your blog. This is another fantastic blog post what I have read to where to buy darvocet n 100. There are so many tools available that it becomes difficult to know which will work. And how best to use them. I enjoy reading far more, and getting a far more active element in the tells you here, while picking up a little understanding as well. The hat is very nice both due to its color and the knitting pattern.I will definitely try it and want to know more designs.Thanks for this post. Very nice and interesting post. It is a lovely pattern but the model makes the difference. Lovely!! buy online percocetThis site is excellent and so is how the subject matter was explained. I also like some of the comments too.Waiting for next post. I love this pattern and couldn't help but make it for my girls. Thank you for sharing. Full of useful resource and great layout very easy on the eyes. Please do keep up this great work. It is amazing post here.......! so cute this hat !I love it very much but I prefer french translation tuto ... If possible, could you make it for me or for also french readers? I made 2 of these hats just in a few hours this evening. I have some adults wanting me to make some for them! Would you be willing to help me figure out how to adjust this to fit an adult? I have dabbled in crocheting for years and have recently (as in last 2 years) really tried to get back into doing it and teaching myself new things. I'm not near good enough to be able to figure out the adult sized adjustments on my own. Thanks! Very cute. Love your whole site. Can't wait to finish the one I am working on so I can start another! Just wish I had little models! My girls are 9 and 14 and the little baby hats just don't work any more. Beautiful pattern, where can I find the scarf pattern? 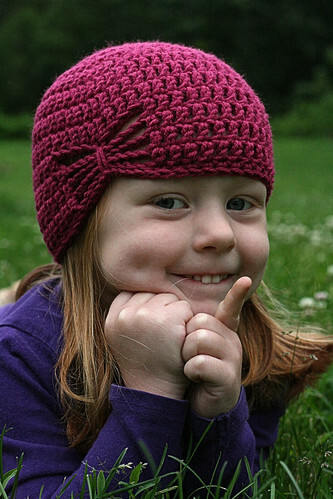 Very cute hat that is made by you and have given a good idea to make this hat.I will make for little cute girl. This is so cute but I am a beginner and I am stuck at 13 I don't understand what I am supposed to do after te chain 5. This pattern was super easy to follow and extremely quick to finish up! Thank you so much for sharing. I'll be sure to post your link on my blog and thank you for sharing again!! My daughter loves the pattern. Pardon my newness....Round 4...Is it 2 then 1 and 1, then 2 then 1 and 1, repeating? HI! just found your blog. love the hat. making it now. just a quick question. on RND 13 where the chains are, you say ch 5, then sc in each ch... then there's another ch 5...I don't see where that is in the picture. Wow! What a beautiful hat of baby. I am expecring a baby girl (any day now!) and today i have made both this hat (modified to be smaller) and the brimmed baby hat! Thank you so much for theses awesome patterns! I also made the brimmed hat for my 3month old niece for Christmas! I just made this for my friends little girl who turned 4. I can't wait to see her when she opens her gift. :) Thank you so much for sharing this wonderful pattern. btw...I live in Brewer! :) I found your site via Ravelry. I love this pattern. All of my granddaughters and my niece and her two daughters absolutely love it too. I was wondering if you have come up with a matching scarf? I tried to design one, but I just couldn't keep the sides straight. They want to bow in. Didn't turn out very well. I am still new to crocheting and I really like this hat! How would I go about trying to make this for an adult female? Super cute. I'm going to make it for a ministry that gives hats to the poor. I know some little girl will love it! Thanks!!! Did you know there are vitamins that cause toxicity if you take too much? Good share, great article, very usefull for us. I am just looking for information like this. Please keep updating with great posts like this one. She look so pretty on that pattern. Definitely going to try some with this fabulous instructions! Hello I would like to make this for a friend of mine with breast cancer as she just lost all her hair. How could I make this into an adult women's hat? Doing this as my first ever crochet project :D LOVING IT!!! next step should i anchor/attatch it to the chain 5 in the previous rows chain 10 and then do the loop/chain 5 into the 5th stitch of the skip 9? and then chain another 5 and sc in the rest of the dc until finished?? This is adorable! I just crocheted one for my 4-year old daughter in 1 1/2 hours. Perfect project and she'll be so excited to see it in the morning! Thanks. I am so glad this internet thing works and your article really helped me. Might take you up on that home advice you..
Wow! It's really amazing.... It's awesome to be found this blog. I like to visit your blog regularly So keep posting such an interesting information. You had done a great work! Hi, I have just finished making the hat, but it didn't work. I checked everything twice before i went to the next round. My head is 20 1/2'' exactly. I used a 6.0mm hook (coversion chart said this was a J size) and I don't know what went wrong. Did i do the first round wrong? I made 3 chains and then did 11 double crochet's in the first chain I made, it had a hole then I slip stitched it to the start and went onto my second row, did i do this right? Did i use the wrong hook????? Please help! It looks like a plate cover, does it start out flat then curve over the sides? LOVE this hat!! I am making it as I type this. I posted on the DOLL version, asking how to make it larger, never mind, found it, right here! Cannot thank you enough for the great patterns you offer. WOW SUPER EASY - Just finished mine for a child size. Took me approx 1 1/2 (or tad less) hour to make. This is the SIMPLEST Butterfly hat I have found. TY again! Off to make more!! Super cute and easy!!!! Thanks :).